Which of the following is the correct answer to this question? The puzzle above is from Ross Honsberger’s More Mathematical Morsels (1991). 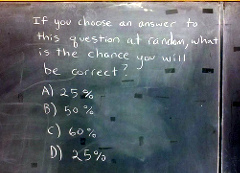 If you found it absurd, try the one shown here in the photo, which is even more daft!